The Flash isn’t running away anytime soon. Recently, The CW announced they’ve renewed the TV series for a fifth season. The DC superhero drama stars Grant Gustin as Barry Allen (aka The Flash), a young man with the power of super speed. The cast also includes Candice Patton, Danielle Panabaker, Carlos Valdes, Tom Cavanagh, and Jesse L. Martin. Superhero series have been a boon for The CW and The Flash‘s ratings prove that. So far, season four is averaging a .85 rating in the 18-49 demo and 2.362 million viewers, making it The CW’s highest-rated TV show for the 2017-2018 season. April 2, 2018 (Burbank, CA) – The CW Network has given early renewals to ten of its primetime series for the 2018-2019 season, it was announced today by Mark Pedowitz, President, The CW. 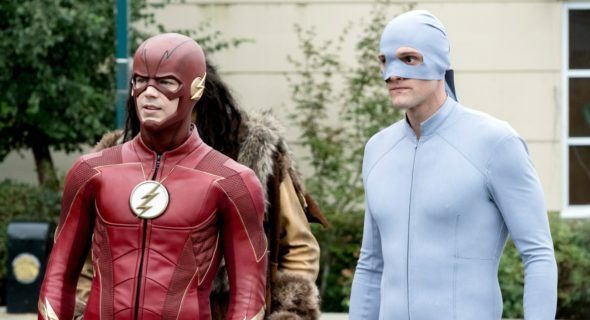 The series being ordered for the 2018-2019 season include second seasons of the electrifying freshman hit BLACK LIGHTNING and DYNASTY, which recently saw the debut of Nicollette Sheridan as Alexis Carrington, as well as new seasons of ARROW (Season 7), CRAZY EX-GIRLFRIEND (Season 4),DC’S LEGENDS OF TOMORROW(Season 4), THE FLASH (Season 5), JANE THE VIRGIN (Season 5), RIVERDALE (Season 3), SUPERGIRL(Season 4), and SUPERNATURAL(Season 14). Specific premiere dates for each series will be announced at a later time. As noted in the above press release, The CW issued early renewals for a total of ten shows, today. Check out the renewals for: Arrow, season seven; Black Lightning, season two; Crazy Ex-Girlfriend, season four; DC’s Legends of Tomorrow, season four; Dynasty, season two; The Flash, season five; Jane The Virgin, season five; Riverdale, season three; Supergirl, season four; and Supernatural, season 14. What do you think? Are you a fan of The Flash? Are you glad it’s been renewed? I love the show but they’re struggling to come up with good episodes. I hope the writers come up with some good material for next season otherwise this show is heading downhill. Seems like a lot of these shows are strong in the first 2-3 seasons and then the writers run out of good ideas. I hope that doesn’t happen here.